Comparing enterprise ecommerce platforms can be a challenge. No two are the same, and yet it can be hard to understand both the nuances and crucial functionalities that make one the better choice for your business. Among the key players, SAP Commerce Cloud (previously SAP Hybris) and Salesforce Commerce Cloud are often compared. Both platforms have robust native functionalities, and are able to present solid business cases to stakeholders involved in the different stages of the implementation process. SAP Commerce Cloud and Salesforce Commerce Cloud have also had similar trajectories throughout the years. The original platforms of hybris and Demandware got their start in the late ‘90s, saw exponential growth during the ecommerce boom of the early 2000s, and were eventually acquired by tech behemoths in 2013 and 2016 respectively. Both are incredible platforms, there’s no debate there. But it’s the nuances that can make a big difference. 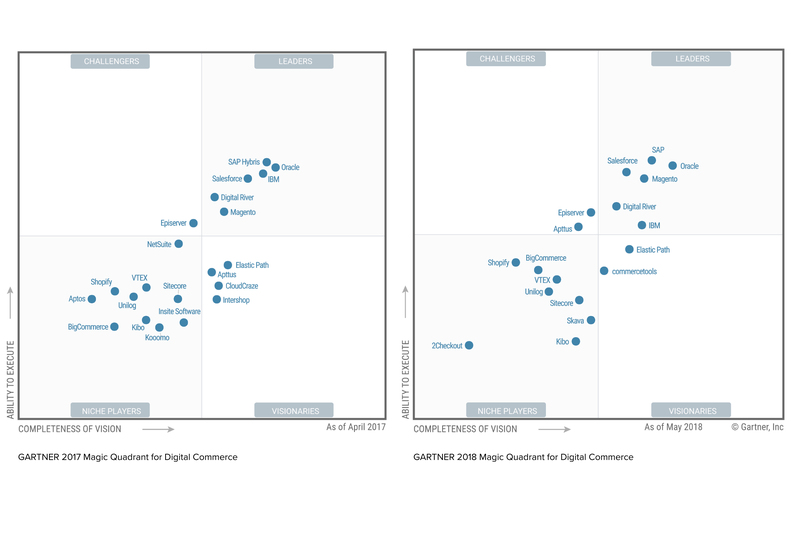 In light of the recent release of the 2018 Magic Quadrant for Digital Commerce by Gartner, we wanted to share an up-to-date comparison based on the latest versions of SAP Commerce Cloud and Salesforce Commerce Cloud, and clarify why SAP Commerce has consistently been top of mind for B2B and B2C retailers. As an SAP Customer Experience partner with experience in Salesforce Commerce Cloud implementations, Corra can help retailers understand the advantages and pitfalls of both platforms. Salesforce Commerce Cloud has many essential ecommerce features built into the platform, such as one-touch mobile payment options and multisite management and localization. In addition, Salesforce Commerce Cloud has access to all of the robust offerings in the Salesforce ecosystem. However, while most of Salesforce’s products are built on Force.com, Salesforce Commerce Cloud is not. This means that while Salesforce has worked on solid integration tools, there may be some complexities pre and post-launch. In addition, merchants should research whether the best tools for their business are supported by Salesforce Commerce Cloud. If not, custom development may be needed to leverage the data and rules that exist on the Salesforce platform, and additional complexities and costs can arise when integrating third-party extensions that are not part of the Commerce Cloud marketplace. SAP Commerce Cloud is only one of the five SAP Customer Experience clouds that can be easily integrated, including SAP Marketing Cloud, SAP Sales Cloud, SAP Service Cloud, and SAP Customer Data Cloud. 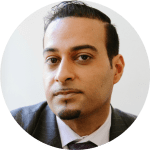 Together, they smooth the path between front office and back office in one simple chain of processes, optimized for machine learning, IoT, and blockchain. In addition, SAP Commerce Cloud has modules and accelerators designed for specific B2C and B2B industries, from grocery to education, to insurance and apparel, for easy setup and use. An additional out-of-the-box feature that SAP Commerce Cloud includes on the back-end and Salesforce does not have is the ability to manage the workflow for product creation. This helps facilitate teamwork, set deadlines, and ensure efficient management of the store. As SAP continues to invest in adjacent technologies, it gives merchants an astonishing degree of flexibility to create a full experience without third-party intervention. One area that Salesforce Commerce Cloud has historically had an advantage over SAP Commerce Cloud is the Admin interface. For anyone involved in day-to-day platform operations, it is an incredibly user-friendly solution. In order to elevate their own experience, SAP Commerce Cloud has stepped up its game and made big improvements in its Backoffice Administration Cockpit. This user-centric back-end interface allows merchants to build custom business tools in a simple and visually appealing way. SAP Commerce Cloud consolidated the number of admin interface elements that existed in older versions, and improved product content management (PCM) by bringing all external-facing data into an easily customizable backoffice UI framework. The Backoffice Administration Cockpit also includes advanced customer services capabilities, and it’s linked to the Assisted Services Module (ASM). If a customer is experiencing issues during the purchase journey, the ASM allows the customer service team to emulate the customer’s cart and provide real-time sales and service support within the same storefront and across the omnichannel framework their customer uses (physically, in-store, and online). An additional out-of-the-box feature that Salesforce doesn’t offer is Smart Edit: a user-friendly way of building personalized customer experiences. With SmartEdit, content can be managed intuitively, utilizing capabilities such as in-context editing, visual tooling, drag-and-drop components management, and preview in different breakpoints (desktop, mobile, etc.). Businesses with B2B needs are approaching ecommerce platforms as more than just a way for resellers to fulfill their orders. Their platform is also a way to attract new customers, market their brand, provide rich experiences, and drive digital commerce initiatives along certain touch points. B2B has typically been a weakness for Salesforce Commerce Cloud and, to fill this lack of experience, Salesforce recently acquired CloudCraze, which gives consumers a personalized shopping journey through multiple channels, including digital, mobile, social, and in-store. Optimized for B2B commerce, Cloud Craze is built on Force.com, integrates will all of the Salesforce applications, and offers essential B2B functions such as contract pricing, multicontract management, and order and pricing overrides based on roles. While this is exciting for Salesforce users, CloudCraze and Salesforce Commerce Cloud are built on two different platforms, and since this is a new acquisition, the roadmap for how they will be integrated is, again, unclear. SAP, on the other hand, has been a leader in B2B for nearly a decade, focusing on B2B since its inception. It is still preferred by many B2B, B2C, and B2B2C clients for the same reasons that it was rated the #1 B2B Commerce Suite by Forrester Research and a leader in the 2018 Magic Quadrant for Digital Commerce by Gartner. 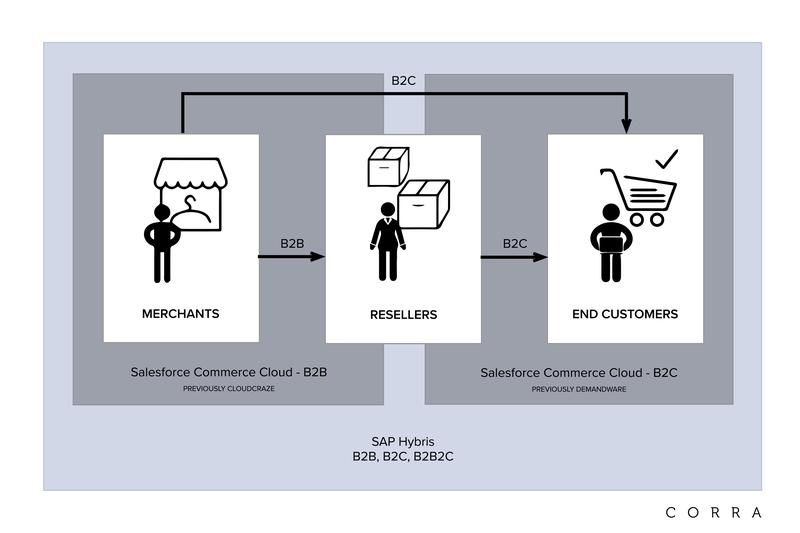 SAP Commerce and SAP Commerce Cloud have consistent, extensive, and sophisticated capabilities for B2C and B2B, and they also support distribution networks that enable a connection between sellers, distributors and end customers (B2B2C). Because of its stability, large global implementation partner network, and vertical industry solution focus, SAP Commerce Cloud B2B functionalities provide end customers with seamless opportunities to buy at every stage of their journey, no matter the complexity of your business. Organization Management: customers can access a self service area to set up and manage their company, define order approval workflows and cost center budgets. PunchOut Integration: suppliers can expose their product catalog to enterprise buyers’ preferred procurement systems (pre-integrated with Ariba). A modern consumer’s journey takes place in the digital and physical worlds. This has made the demand for omnichannel experiences even better. Salesforce Commerce Cloud provides a simplified, cloud-based approach that gives retailers a number of capabilities including merchandising, marketing, order management, operations, and more, all in one centralized platform. SAP takes a different approach for omnichannel, integrating all digital and physical customer touchpoints onto a single, robust platform, including online, mobile, point-of-sale, call center, social media, and print. Omni Commerce Connect (OCC): a next-generation commerce API that enables retailers to expose key commerce functionality via a RESTful Web service API thus integrating core commerce functionalities into any internet-enabled touchpoint. Agile, flexible, and extensible architecture merchandising for easy use and customization. Easy-to-use tools and cockpits to manage and promote your products and product content for all of your channels. Built for the global marketplace. Whether you’re B2C, B2B, or B2B2C, SAP Commerce Cloud has the architecture to handle high volumes of data, traffic, and orders. This makes an otherwise cumbersome process go smoothly. Order management and fulfillment capabilities allow you to show stock availability across all channels in real time so your customers won’t be disappointed.SAP Commerce Cloud provides a single, easy view of inventory across online/in-store and ability to define stock, sourcing and allocation rules. Intuitive UI: empowers customers with the ability to check stock across stores, please order for pick up, and locate stores. Of course, deciding which platform is right for your business is intimately tied to cost. For both Salesforce Commerce Cloud and SAP Commerce Cloud, implementation is not included and is generally provided by agency partners. After implementation, there are substantial differences between their price structures. Salesforce Commerce Cloud has a revenue-share pricing model and long-term contract lengths, which is a cause of concern for many customers. The cost of your platform license is a percentage of sales and, if your business continues to have success, the cost of your platform license increases. This basically means when a merchant sells more, the revenue share percentage decreases. This works for some, but companies need to do a thorough comparison between a revenue share model and other licensing models. There are also additional costs. Integrations with third-party technologies that are not part of the Salesforce Commerce Cloud marketplace are typically costly and difficult. Even customizations that might seem simple and small can become drawn out and expensive due to the red tape. On the other hand, SAP Commerce Cloud is sold through a subscription-based pricing model. The payment includes software license, SAP Commerce Cloud services, and hosting. Pricing varies from client to client and is calculated by peak page views per second, not revenue. 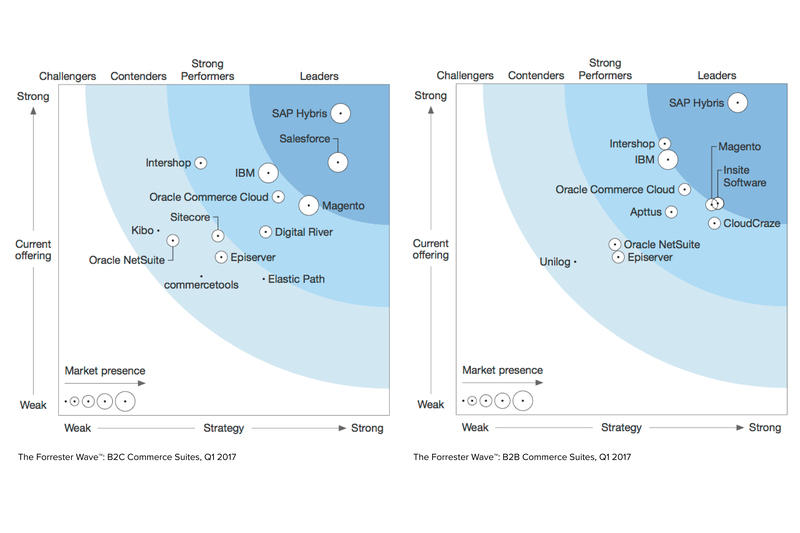 Both Salesforce Commerce Cloud and SAP Commerce Cloud are excellent platforms, so it is not surprising that they are often compared, but the stability, large global implementation of partner networks, and vertical industry solution focus have put SAP Hybris (recently rebranded as SAP Commerce Cloud) at the top of Forrester and the Gartner’s lists of Commerce platforms. For most companies looking at both solutions, SAP Commerce Cloud is the clear choice for an industrial-strength, reliable, and fully functional commerce platform. If you are looking for a personalized comparison to show the difference in capabilities, Corra’s experienced team can provide a side-by-side demo and present the out-of-the-box SAP Commerce Cloud's functionalities that can meet the vast majority of your project requirements. During the demo, we will upload your imagery and products to the SAP Commerce Cloud instance to show you a realistic portrayal of your final solution. Moreover, if you are in the fashion space, Corra's team will walk you through Avant: the only SAP Commerce Cloud-qualified accelerator designed to meet the needs of fashion brands. Corra launched this refined solution to reduce both cost and time-to-market of a typical SAP Commerce Cloud implementation by up to 40%, allowing fashion retailers to bypass the need for costly customizations and to invest more budget in strategic business initiatives. From advanced price display to a highly functional product listing page, Avant incorporates the best practices Corra has perfected through years of strategic commerce advice in the fashion industry, while offering flawless code quality, powerful capabilities, and an elegant front-end. To schedule the demo, contact us today. Steven is a SAP Commerce Cloud certified architect and certified Java programmer with more than 10 years of experience. He joined Corra as a SAP Commerce Cloud Architect to serve as a subject matter expert for engineers, solutions strategists, and clients.